JFK was assassinated in Dallas, Texas, on the 22nd of November 1963 allegedly by one Lee Harvey Oswald. 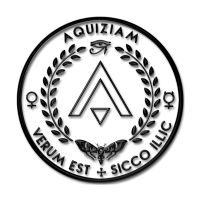 The more time that has past the more information regarding this strange death has entered the public domain. Nearly a third of a century later almost nobody doubts that that JFK was the target of a conspiracy and that a poor excuse for a human being such as Lee Harvey and his 6.5 mm caliber Carcano rifle could have been responsible for the death of an iconic American president. Films have been made about this event. There are more than 20,000 web pages dedicated to revealing the various conspiracy theories and yet, even now, the truth remains a mystery and probably will forever. Two days after lee Harvey supposedly assassinated JFK he was, in turn, assassinated by Jack Ruby. There are over 35 people who were linked to this event that died in mysterious circumstances and where their deaths were strange indeed. Still, some people continue to question whether there was anything really odd? Some compelling reasons to think that there is still much hidden about the strange death of John F Kennedy. 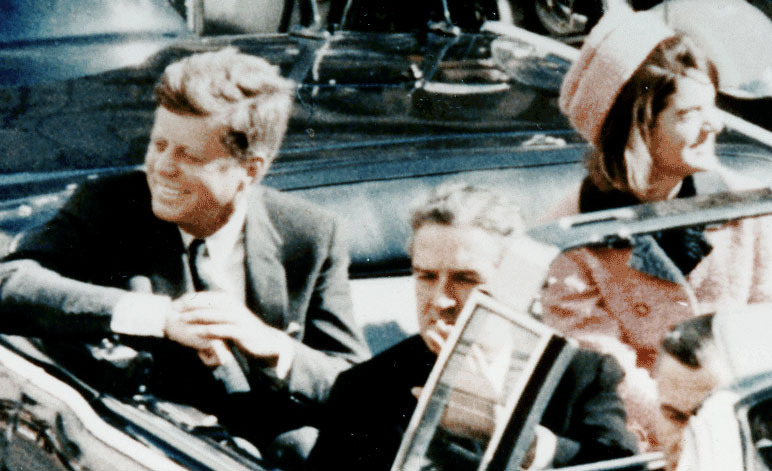 Moments before the assassination of John F Kennedy. The US State Department Actually paid $435.71 (about $3,900 in today’s value) to bring Lee Harvey Oswald, a self-proclaimed Marxist, back to the USA from Russia. This at a time when Communists were the number One public enemy of America? Oswald is said to have fired three shots from the Texas Book Depository. Two are said to have missed the President and are accounted for but the third hit him. According to doctors this 3rd bullet then proceeded to move around Kennedy’s body in a way that no other bullet in history has ever managed to achieve – producing damage equivalent to three additional bullets. This became known as the ‘magic Bullet’. Many witnesses claimed to have heard gunshots from an area called the Grassy Knowle in the opposite direction from the Book depository. This would mean there was at least one additional shooter. 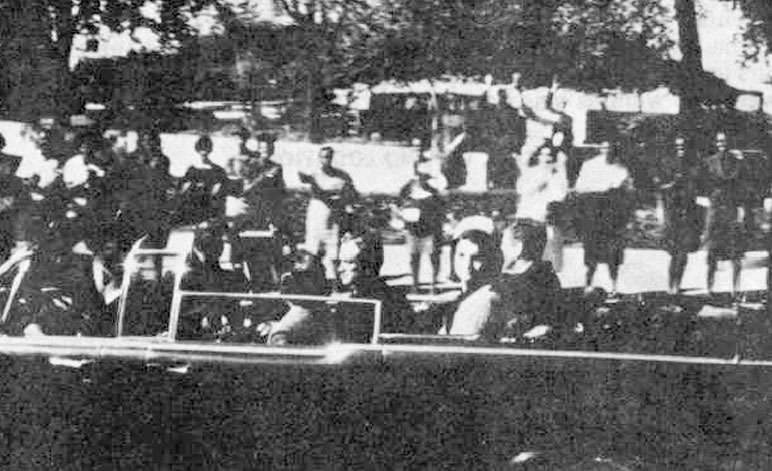 The Umbella Man: Just before Kennedy was assassinated a man in a black suit opened an umbrella as the cavalcade passed. This is clearly visible on the Zapruder film and may have been a signal to hidden assassins. What made this particularly odd was the day was sunny with no chance of rain. After the shooting the man vanished and has never been identified even after a significant search by several USA government agencies. In 1979 a US House Committee inquiry ruled that Kennedy was “probably assassinated as a result of a conspiracy”. They also stated there was “A high probability” that a second gunman shot at President John Kennedy. This report has never been fully accepted by the authorities. Many people who were associated with the Kennedy assassination died suspicious and convenient deaths after the event. These include: Oswald himself, Jack Ruby, David Ferrie, Eladio del Valle and Jack Zangretti. All-in-all over 50 people died either shortly before or after the event. Were all of these just coincidences? Two months before the assassination, a witness (Antonio Veciana) identified Lee Harvey Oswald meeting in Dallas with a CIA Covert Operations chief – David Atlee Phillips. One doctor who examined President Kennedy said that he believed the President had been shot from at least two directions. Medical staff were denied the opportunity to dissect the wounds to prove or disprove this finding. The moment of the assassination - 'Croft Picture' taken around z161. 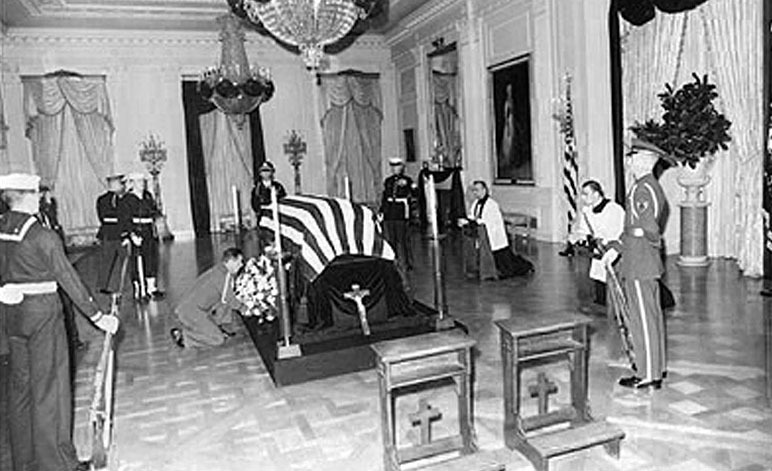 John F. Kennedy 'Lying in State' in the East Room of the White House on November 23, 1963. The Babushka Lady: Various photographs and the Zapruder film show a woman with a headscarf filming the assassination. The authorities believe that her position and therefore her film would have clearly proved or disproved that the president was shot multiple times from different directions. After the shooting the lady walked away and has never been identified nor has her film ever been discovered.